Museum Triennial, such as carpenters, curators, editors, artists, museum office workers, are given a questionnaire about their dinner habits in advance of the exhibition opening reception. Based on their individual responses, Bona Park (born 1977, Seoul, Korea; lives and works in London and Seoul) purchases groceries for each of the respondents to prepare dinner at home, after the event. The participants carry their respective grocery bags at the opening reception, and it is only when the public notices the matching bags and asks a participant why s/he is carrying the bag that the artist’s contribution becomes visible. With these stand-ins for the artist, Park reverses the public positions of the many people who work behind the scenes in the preparation of an exhibition, repaying their extended duties with groceries reflecting her interpretations of their personalities, desires, and needs. A performance in which the museum staff is given bags of groceries relating to their typical dinner habits. 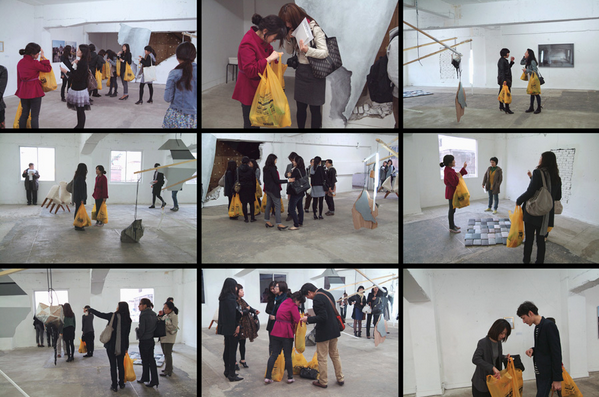 At the exhibition's private viewing, artists meet audiences while carrying yellow plastic bags. After the event, they can bring home the groceries and prepare supper. The title of the work is a parody of Marcel Duchamp’s work La boîte-en-valise. 1) What time do you usually have dinner? 2) With whom do you usually have dinner? 2.1) Please write down topics of your conversation that you often have while having dinner. 2.2) If you mostly eat alone, which TV show do you watch, if any? 2.3) If you mostly have dinner alone but you do not watch TV, please describe what you look at while eating. 3) What menu do you most often enjoy for dinner? 5) Which foods do you dislike? 6) Do you have any food allergies? If you do, please describe. 7) How long does it usually take you to finish your dinner? 8) Do you usually like salty or sweet foods? 9) Do you like spicy foods? 10) What is your favorite color? 11) Are your teeth in good condition? 13) Are you left handed or right handed? 14) When you shop for dinner, do you usually buy organic foods or foods on sale? 16) If you have a pet, do you feed it before your dinner or after? Please only answer this question if you have a pet. 17) What is your most memorable dinner experience? With whom did you eat and what did you have? 18) What was your worst dining experience? With whom did you eat and what did you have? 19) Do you drink water while you have dinner or separately? 20) Do you feel happy when you have dinner? This is a multi choice question. The 2012 New Museum Triennial features thirty-four artists, artist groups, and temporary collectives—totaling over fifty participants—born between the mid-1970s and mid-1980s, many of whom have never before exhibited in the US. “The Ungovernables,” the second triennial exhibition at the New Museum, acknowledges the impossibility of fully representing a generation in formation and instead embraces the energy of that generation’s urgencies. These urgencies are formal and philosophical, material and ideological. They stem from the unique experiences of this generation who came of age in the aftermath of the independence and revolutionary movements that promised to topple Western colonialism. However, these revolutions became mired in military dictatorships, the emergence of integrated world capitalism, regional and global economic crises, the rise of fundamentalism, and international interventions as well as failures to intervene. Faced with this somewhat bleak inheritance, artists in “The Ungovernables” embrace their complex relationship to history and assert a remarkable resourcefulness, pragmatism, and hopefulness in their work. Historically used as both a derogative colonial term to justify violent repression of the “natives” (“These people are ungovernable!”) and an affirmative call for civil disobedience (“We will make this country ungovernable!”), ungovernability is a double-edged sword that pursues a radical change in the everyday, but promises an upheaval that is not necessarily controllable. In terms of this exhibition, “The Ungovernables” is meant to suggest both anarchic and organized resistance: protest, chaos, and imagination as a refusal of the extended period of economic, ideological, sectarian, and political conflict that marks the generation’s inheritance. But the title also suggests a dark humor about this inheritance and the nonsentimental, noncynical approaches to history and survival it requires. Lingering in the present, artists in the exhibition embrace temporality and impermanence to explore new contingencies for an unknown future. “The Ungovernables,” then, is about rejecting incorporation and monetization, recognizing heat, transforming potential, and offering possibilities while maintaining self-awareness, humility, and humor. Rejecting proscribed relationships to history and society, artists in “The Ungovernables” enact the present they desire through their work. The exhibition attempts to provide a platform for these multifaceted presents, with its structure responding to the urgencies of the artists and the form of the works themselves. The exhibition includes artists’ residencies conducted over the past year (including three that extend beyond the opening of this exhibition) and several works, “invisible” in the galleries, that take place before, during, and after the exhibition. A full list of these activities can be found at newmuseum.org/theungovernables. These temporal, performative, and research-oriented works resonate with instances of drawing, sculpture, video, and installation also found in this exhibition. In addition to his work for “The Ungovernables” Adrián Villar Rojas presents a new site-specific sculpture called Before My Birth at the World Financial Center Plaza (220 Vesey Street between West Street and North End Avenue), from March 1-29, 2012 in conjunction with the New Museum Triennial. In Before My Birth, Villar Rojas endeavors a distinct approach to his material of choice. Clay no longer holds the mythological connotations that the artist has given it for so long. Instead it becomes a background device that frames a system of minimal resources. “The Ungovernables” is organized by Eungie Joo, Keith Haring Director of Education and Public Programs, with Ryan Inouye, Curatorial Assistant. Building on the Museum as Hub model, “The Ungovernables” incorporated lengthy consultation with a network of curators, organizations, and artists from around the world, including Museum as Hub partners. Their contributions have inspired the Art Spaces Directory, a resource guide to over 400 independent art spaces around the world, co-published by ArtAsiaPacific magazine and featuring essays by Víctor Albarracín, Reem Fadda and Christine Tohme, Stefan Kalmár, Naiza H. Khan, Catalina Lozano, Elaine W. Ng, and tranzit.org. “The Ungovernables” will also be accompanied by an exhibition catalogue designed by Santiago Piedrafita, Head of Graphic Design, North Carolina State University, and published by Rizzoli. The catalogue will include full color, four-page spreads on each of the thirty-four artists and groups; as well as essays and fiction by several participating artists, writer/curator Miguel A. López, curator Gabi Ngcobo, and Triennial curator, Eungie Joo. The Generational Triennial is a signature initiative of the New Museum. It is the only recurring international exhibition in New York City devoted to emerging artists from around the world, providing an important platform for a new generation of artists who are shaping the current discourse of contemporary art and the future of culture. The first edition in 2009, “The Generational: Younger Than Jesus,” featured fifty artists, from twenty-five countries, born after 1976.